First 5 cases in Nov 2015 RTP, Remaining Cases will complete soon. 1. Whether contaminated, under or over filled bottles or badly crowned bottles amount to manufactured finished goods which are required to be entered under R.G.-1 register, and which are exigible to payment of excise duty? Revenue Contention: Contaminated, under filled, over filled, badly crowned bottles were excisable goods if defective or non-marketable appellant should have sought remission of duty. excise duty could not levied on the goods which had not been manufactured and which were not marketable. Court: The Court observed that only a finished product can be entered in RG 1 register. A finished product is a product which is manufactured as well as which is marketable. Under filled or over filled or badly crowned caps bottles are neither manufactured goods nor finished goods. Bottles filled with less or more aerated water were not marketable under the Legal Meteorology Act, 2009 , Such goods Can’t be entered in R.G. 1 register. High Court"s Decision: The Court held that in the instant case, contaminated, under filled, over filled and badly crowned bottles found at the stage of production were not marketable goods. Thus, they were not required to be entered under R.G. -1 register and consequently, no excise duty was payable on them. 2 Should a part of sales tax retained by the manufacturer from its customers under a tax concession granted to it, be included in the transaction value of such goods under section 4(3)(d) of the Central Excise Act, 1944? Facts of the Case: The assessee was a prestigious unit manufacturing and selling vehicles in the State of Haryana. Being a prestigious unit, a tax concession was granted to the assessee considered by the High Powered Committee (HPC) under the erstwhile Haryana General Sales Tax Rules, 1975. Therefore, an entitlement certificate was issued to the assessee for implementation of the decision of HPC. Dept. issued SCN on the ground that on the sale of its vehicles during the period in question, the assessee had deposited only 50% of the sales tax collected by it from its customers and retained balance 50% availing the tax concession granted to it. The entitlement certificate also did not give any indication of deferment of tax or capital subsidy. the assessee retained 50% of the sales tax collected from its customers and it was neither actually paid nor actually payable to the Government. that since assessee retained 50% of the sales tax collected from customers which was neither actually paid to nor actually payable to the Government, transaction value under section 4(3)(d) of the Central Excise Act,1944, would include the amount of sales tax. 3. Will rule 6 of the CENVAT Credit Rules, 2004 apply, if the assessee clears an exempted by-product and a dutiable final product? Facts of the Case: Assessee was engaged in the manufacture of a dutiable product. During the manufacturing process, a by-product was produced which was exempted from the excise duty. „ by-product? when such by-product emerged as a technological necessity. If the According to Revenues stand: Final and By Product have the same meaning thereby obliterating(wiping out) the difference, though recognised by the legislation itself. 4) Whether CENVAT credit can be availed of service tax paid on customs house agents"(CHA) services, shipping agents" and container services and services of overseas commission agents used by the manufacturer of final product for the purpose of export, when the export is on FOB basis? High Court: On the Basis of Various Cases and Definition of Input Services,There is no specific inclusion of such services in the definition of input service with regards to CHA services, shipping agent?s services, container services and services of overseas commission agent as per substantial question of law. Place of removal would be the port in this case as per the definition of Input service . Place of removal has a vital role to play in CCR 2004, THEREFORE SERVICES TILL THE PORT are covered in definition of Input Services. (Cadila Health Care Ltd, 2013), The services of overseas commission agent also, the decision of this Court in Cadila Healthcare Ltd. 2013 is applicable wherein it was held that the CENVAT credit on a service could be availed if that service is used directly or indirectly in the manufacture or clearance of final product. Overseas Agent services have not been used for these purposes hence CCR is not admissible in respect of Commission paid to foreign agents. HC Decision: The High Court held that CCR in respect of (i) customs house agents services, (ii) shipping agents and container services and (iii) cargo handling services is admissible, but the CENVAT credit availed for the services of Overseas commission agent is not allowed. 5. Can CENVAT credit availed on inputs (contained in the work-in-progress destroyed On account of fire) be ordered to be reversed under rule 3(5C) of the CENVAT Credit Rules, 2004? The respondent assessee was engaged in manufacturing of Oil Seals. On account of fire accident in the factory, the work in progress stocks were burnt And rendered Unfit for Use. SCN was issued to assessee demanding the CENVAT credit availed On raw materials destroyed along with the interest and penalty. Dept, didn’t dispute the fact the Raw Materials were destroyed. Assessee contended that CCR could not be reversed as Inputs were used in Manufacture of Final Products. Revenue: Placing reliance on Sec 3(5C) of CCR 2004, Assessee was bound to reverse the CCR availed. High Court : Rule 3(5C) can be invoked where on any goods manufactured or produced by an assessee, the payment of duty is ordered to be remitted Under rule 21 of the Central Excise Rules, 2002.Thus, only in such case, the CENVAT Credit taken on the inputs used in the manufacture of production of said goods shall be reversed. Decision: The High Court held that CENVAT credit would need to be reversed only when the payment of excise duty on final product is ordered to be remitted Under rule 21 of the Central Excise Rules, 2002, which deals with the remission of duty. Inputs (contained in the work-in-progress) destroyed in fire. 7) Whether sales commission services are eligible input services for an availment of CENVAT credit? If there is any conflict between the decision of the j jurisdictional High Court and the CBEC circular, then which decision would be binding on the Department? Also, if there is a contradiction between the decisions passed by Jurisdiction High Court and another High Court, which decision will prevail? Assessee contention: Were entitled to CCR(Cenvat Credit) as per CBEC Circular dated 29.04.2011 and could not take a contrary view. Decision of the Gujarat HC in case of Cadila Healthcare Limited referred by the Revenue is opposite to that of the Punjab & Haryana HC in the case of Commissioner v. Ambika Overseas 2012, wherein the CCR on such input services was allowed to the assessee, hence the matter should be referred to the Larger bench. and no stay order was granted in that case. 6. Is a cellular mobile service provider enti tled to avail CENVAT credit on tower parts & pre-fabricated buildings (PFB)? The appellant was engaged in providing cellular telephone service and was paying service tax on the same. The appellant availed CENVAT credit of excise duty paid on the Base Transreceiver Station (BTS) claiming to be a single integrated system consisting of tower, GSM or Microwave Antennas, Prefabricated building (PFB), isolation transformers, electrical equipments, generator sets, feeder cables etc. Appellant treated these systems as “composite system” classifiable under Chapter 85.25 of the Central Excise Tariff Act [CETA]. (i) BTS had independent functions and it could not be treated and classified as single unit. (ii) Tower was fixed to the earth and IMMOVABLE and Hence not goods.Even in CKD or SKD condition, the tower and parts are classified under Chapter heading 7308 of the CE Tariff Act which is not specified in clause (i) of Rule 2(a)(A) of the CCR, 2004 as capital goods. It would be Wrong to accept that tower is a part of antenna. An accessory or Part which would be utilized to make the goods a finished product or such articles which would go into the composition of another article. Towers are structures fixed to the earth on which the antennas are installed and hence, cannot be considered to be an accessory or part of the antenna. 8) Is interest payable under rule 7(4) of the Central Excise Rules, 2002 if amount of differential duty paid in full before final assessment order is passed? Decision: HC observed that assessee had paid differential amount before Final Assessment of duty Liability to pay interest under rule 7(4) arises on any such amount payable to Central Government consequent to order for final assessment under rule 7(3). The Court opined that in the assessee?s case, final assessment resulted in no dues payable to the Government; later part of rule 7(4) was not attracted. 9. In case the revenue authorities themselves have doubts about the dutiability of a product, can extended period of limitation be invoked alleging that assessee has suppressed the facts? Facts: As per the requirements of customers, Appellant was cutting larger steel plates into different shapes & sizes And supplying the same to customers The process was known as profile cutting. Appellant was of the view that the above process was not manufacture as per Sec2(f) of CE Act 1944 and hence didn’t pay Excise Duty. A SCN(Show Cause Notice) was issued by Department demanding Excise Duty as it opined that the above Profile Cutting amounted to Manufacture under Sec2(f) of CE Act 1944 An extended period of limitation was invoked as per Sec 11A of the CE Act 1944, as it was held by the Dept that assessee was suppressing and misrepresenting facts. Dispute: Assessee held there was no suppression of facts and hence invoking Sec 11A was unnecessary. Orginal in Order(OIO) in case of M/s Pioneer Profile Industries, Pune was referred to by the assessee, wherein the Commissioner held that Profile Cutting was manufacture as per Sec 2(f) of CE Act 1944,Penalty was not imposed as there was a doubt whether it was manufacture Supreme Court: M/s Pioneer Profile Industries case was referred to, by the Apex Court. Wherein Dept had doubts regarding excisability of Profile Cutting Process And if the assessee is bonafide(genuine) in his conduct regarding the non payment of Excise duty on the basis of his belief that the above Cutting Process is not manufacture, Then extended period of limitation cant be invoked and penalty should be set aside. 10. Can an appeal be filed before the Supreme Court against an order of the CESTAT relating to clandestine removal of manufactured goods and clandestine manufacture of goods? Appeals relating to clandestine removal of manufactured goods and clandestine manufacture of goods are not maintainable before the Apex Court under section 35L of the CE Act, 1944 as per the decision of Apex Coourt. 11. Does the Commissioner (Appeals) have the power to review his own order of predeposit? High Court"s Decision: The HC held that there is no provision of law under the CE Act 1944 the Commissioner (Appeals) doesn’t have the power to review his order. Whereas power is available to the Tribunal under section 35C(2) of the CE Act, 1944 to rectify any mistake apparent on the record. The High Court elaborated that when there is no power under the statute, the Commissioner (Appeals) has no authority to entertain the application for review of the order. 12. Does preparation of ready mix concrete (RMC) along with pouring, pumping and laying of concrete amount to provision of service? Assessee was engaged in preparation of RMC, Along with the dominant objects, ancillary and incidental Activities like pouring, pumping and laying of concrete were also carried out. Revenue opined the above process was not only sale transaction as it contained an element of service in it.Hence assessee was liable to pay Service Tax. Department: Activities like pouring, pumping and laying of concrete is a significant part of the transaction and not incidental to transaction of sale. Tribunal opined that agreement to supply RMC does not constitute any taxable service Aggrieved by such an order, the Revenue, preferred an appeal before the Supreme Court. Supreme Court Decision: The Apex Court, upheld the decision of the Tribunal, where it was held that contract between parties was to supply RMC and not to provide taxable services, Finance Act, 1994 is is not a law relating to commodity taxation, the adjudication was made under mistake of fact and law fails. Hence the Apex Court dismissed the Revenue’s plea..
13. Whether supply of food, edibles and beverages provided to the customers, employees and guests using canteen or guesthouse of the other person, results in outdoor caterer service? service to NTPC or LANCO but only sold goods in their canteens to individual customers (not to NTPC and LANCO). NTPC and LANCO provided a place for running the canteen on rent Certain maintainence & running expense was reimbursed. Thus, there should not be any service tax liability on this activity. Revenue demanded service tax from the assessee by treating the activity of the assessee as outdoor catering services as the assessee was engaged in providing catering services from a rented premise.. Revenue concluded that it made no difference even if food and other edibles were consumed by employees of NATCO or LANCO or who use the guest house or facility, the position that the service was provided by the assessee to NTPC or LANCO, and attracted service tax. HC held that the assessee was liable for payment of service tax as an outdoor caterer. 14. Whether the course completion certificate/training offered by approved Flying Training Institute and Aircraft Engineering Institutes is recognized by law (for being eligible for exemption from service tax) if the course completion certificate/ training/ is only for the purpose of eligibility for obtaining ultimate licence/approval for certifying repair/maintenance/airworthiness of aircrafts? The assessee was running a Flying Training Institute and Aircraft Maintenance Engineering Institute It provided training and coaching to individuals in the field of flying of aircraft for obtaining Commercial Pilot License from the Director Civil Aviation (DGCA), New Delhi, also provided training for obtaining Basic Aircraft Maintenance Engineering Licence. Department demanded service tax on this training activity. However, the assessee contended that since the services were leading to the grant of diploma/certificate recognized by the law, the services were exempt Based on the case of Indian Institute of Aircraft Engineering v. Union of India 2013 in which the Delhi HC in the similar matter held that such services were not chargeable to service tax being exempt. The Aircraft Act, 1934 (the Act) and the Aircraft Rules, 1937 (the Rules) and the Civil Aviation Requirements (CAR) are issued by the DGCA . Hon'ble High Court concluded that the training conducted by the appellant in that case having a recognition of law and is not covered under commercial or coaching training centre as defined under Section 65(27) of the Finance Act, 1994. Revenue had not been able to persuade the Court to take a contrary view as taken by the Delhi High Court in Indian Institute of Aircraft Engineering. The appeal filed by the Revenue would not give rise to any substantial question of law. Hence, the appeal filed was dismissed and the assessee was held not to be liable to pay service tax. 15. Whether deputation of some staff to subsidiaries/group of companies for stipulated work or for limited period results in supply of manpower service liable to service tax, even though the direction/control/supervision remained continuously with the provider of the staff and the actual cost incurred was reimbursed by the Subsidiaries/group companies? Revenue sought to recover service tax from the assessee for the reimbursement recovered by it from its group/subsidiary companies for the cost of such employees on deputation under the service category of Manpower Supply. High Court:HC opined that services provided by assessee wasn’t Manpower Supply Services. Though the assessee deputed its employees to reduce costs to group company, it had all the supervision and control over its employees Actual cost incurred by the assessee in terms of salary, remuneration and perquisites was only reimbursed by the group companies No element of profit or finance benefit. The subsidiary companies can’t be termed as their clients.HC noted that the employee deputed did not exclusively work under the direction or supervision or control of subsidiary company. Decision: Revenue’s contention was rejected by HC and held that deputation of the employees by the respondent to its group companies was only for and in the interest of the assessee. There is no relation of agency and client. There was no direct indirect or temporary supply of Manpower by assessee to its client Therefore, they were not liable to pay service tax. 16. Whether section 66E(i) of the Finance Act, 1994 which levies service tax on the service portion of activity wherein goods being food or any other article for human consumption or any drink (whether or not intoxicating) is supplied in any manner as a part of activity, is ultra vires the Article 366(29A)(f) of the Constitution? (a) Whether any service tax can be charged on sale of an item or vice versa? (b) Whether in view of Article 366(2A)(f) service is subsumed in sale of foods and drinks and whether such Article is violated by section 66E(i) of the Finance Act, 1994? With reference to question (a) above, the HC observed that a tax on the sale and purchase of food and drinks within a State is in exclusive domain of the State. The Parliament cannot impose a tax upon the same. Service Tax cant be imposed in List II or List III of the Seventh Schedule to the Constitution under States can’t impose tax on any service. The quantum of services to be taxed is explained under rule 2C of the Service Tax(Determination of Value) Rules, 2006 read with Notification No. 25/2012 ST notified by the CG. Rule 2C presumes a fixed percentage of bill value as the value of taxable service on which service tax should be charged. VAT doesn’t bifurcate Value of Service & Sale. outdoor catering, it is presumed to be 60% of the bill value.Hence the value of the food is taken to be 60% of the bill in the case of restaurant and 40% of the bill in case of catering service. High Court's Decision: The HC held that section 66E (i) of the Finance Act, 1994 is intra vires the Article 366(29A)(f) of the Constitution of India. 17. Can the expression "suppression of facts? be interpreted to include in its ambit, mere failure to disclose certain facts unintentionally? High Court’s Decision: According to HC held that willful suppression & mere failure Disclose certain facts are not same unless it is preceded Deliberate non-disclosure to evade the payment of tax is Willful Suppression. The extended period of limitation can be invoked on willful non disclosure of facts with intention to evade the tax by non-disclosing the fact which, if disclosed, would attract service tax under sections 66 (now section 66B) & 67 of the Finance Act, 1994. The non-disclosure of the fact which, even if, disclosed would not have attracted the charging section is not suppression of fact for the purpose of extension of limitation period. 18. Is exemption in relation to service provided to the developer of SEZ or units in SEZ? available for a period prior to actual manufacture (which is the authorized operation) of final products considering these services as the services used in authorized operations of SEZ? Facts of the Case: Assessee had manufacturing operations in the SEZ. Development Commissioner of SEZ granted an extension of 1YR to the assessee to start manufacturing operations (which were authorized operations of the SEZ). The assessee procured certain services (scientific and technical consultancy) during this period (before beginning of the manufacture) in order to enable it to undertake manufacturing activity. Assessee applied for refund of service tax paid on such input services under Notification No. 9/2009 ST dated 03.03.2009, the refund was denied on the ground that since the services were received before the authorised operations (i.e., manufacturing) started, the said input services would not be considered to have been used in authorised operations of SEZ unit, and thus, would not get qualified for refund. “Authorized operations”: “Such operation so authorized shall be mentioned in the Letter of approval”. AS PER sec4(2)and sec 15(9) of the SEZ ACT 2005. Assessee contended that it is necessary for SEZ to procure taxable services right from the initial stage and only with the support service of business that the unit would start functioning for production. CESTAT concurred with the opinion of assessee, regarding refund to assessee , the matter was brought before the High Court by the Department. The High Court relied on its decision passed in the case of Cedilla Healthcare Ltd 2013 concurred with the CESTAT regarding the refund to assessee; though the operations of the assessee did not reach to the commercial production stage, the input services of scientific and technical consultancy procured by them were in relation to the manufacture which would take place at a later date. Services rendered for a period prior to actual manufacture of final product is commercial activity/production and assessee is entitled to exemption by way of refund claimed. 19. Is „hiring of cab? different from „renting of cab? for service tax purposes? High Court's Observations: The High Court opined that under rent -a-cab scheme, the hirer is free to take on rent any vehicle of his choice, but has to inform his movements to the holder of the license informed of his movements from time to time. When a person chooses to hire a car, which is offered on the strength of a permit issued by the Motor Vehicles Department, then the owner of the vehicle, who may or may not drive the vehicle, Owner will offer his service while retaining the control and possession of the vehicle with himself. The customer travels in the vehicle provided by the owner and pays for the service as per the kilometers travelled HC opined that though rent and hire may, in a different context, appear same in relation to rent a cab and hiring but are different transactions. High Court's Decision: HC upheld the decision of the Tribunal wherein it was held that unless the control of the vehicle is given to the hirer and he is given possession for a period , it could be small period of time, which the contract contemplates, to deal with the vehicle subject to the other terms of the contract; there would be no renting. 20. Whether the recipient of taxable service having borne the incidence of service tax is entitled to claim refund of excess service tax paid consequent upon the downward revision of charges already paid, and whether the question of unjust enrichment arises in such situation? Revenue filed an appeal to HC in relation to the above question not satisfied with the reply of the CESTAT Revenue opined that the respondent being service receiver was not entitled to file a refund claim under section on 11B as the expression “any person” in section 11B of the Central Excise se Act, 1944 does not include the recipient of the service. The Revenue submitted before the High Court that the principles of unjust enrichment as provided in section 11B were not considered by the CESTAT while allowing the refund claim and that the refund claim filed was not within the period of limitation of one year under section 11B. The HC relied on the case of Mafatlal Industries Ltd. v. Union of India 1997 wherein the Supreme Court held that “ Where the incidence of duty has been passed on, the claimant has not suffered any loss, and The person who has paid the duty can legitimately claim refund. Respondent being Service Receiver had paid service tax, hence no unjust enrichment, Hence respondent was entitled to claim refund for excess tax paid on downward revision of rates. HC observed that respondent had not paid the tax within period of limitation and same was not challenged by Revenue in an appeal before Commissioner(Appeals) or before the Tribunal in the form of cross objections. HC relied on Supreme Court’s decision in the case of Commissioner of Customs v. Toyo Engineering India Limited 2006 wherein it was held that the Revenue could not be allowed to raise submissions for the first time in a second appeal before the Tribunal. Decision: HC held there was no unjust enrichment under Sec 11B of Central Excise Act, 1944, (Sec 83 of Finance Act, 1994), as the service receiver, (respondent) had paid the tax and not passed on the incidence, the HC held that once the finding of the adjudicating authority that the claim for refund was filed within the period of limitation was not challenged by the Revenue before the 1st appellate authority and CESTAT, Revenue could not prove contrary and first time urge a point in an appeal before this Court which was not raised in grounds of appeal before authorities below. 21. Whether the amendment made by Finance Act, 2013 in section 37C(1)(a) of Central Excise Act, 1944 to include speed post as an additional mode of delivery of notice is merely clarificatory in nature having retrospective effect or does it operate prospectively? The contention of the assessee was that the amendment made in section 37(C)(1)(a) of the Central Excise Act,1944 which added “speed post” as an additional mode of service of notice could only operate prospectively and not retrospectively. HC was of the view that addition of the term “speed post” in section 37(C)(1)(a) was merely clarificatory The HC pointed out that since for both “registered post” as well as “speed post”, receipts are required to be issued when articles are delivered to the post offices, both “speed post” and “registered post” satisfy the requirement of section 28 of the Indian Post Office Act, 1898. HC opined that where an amendment which is “clarificatory in nature”, the same would date back to the date on which the original provision was introduced*. High Court’s Decision: The High Court, therefore, held that insertion of words “or by speed post with proof of delivery” in section 37C(1)(a) of the Central Excise Act, 1944 is clarificatory and a procedural amendment and hence, would have retrospective effect. 22. Can the Commissioner (Appeals) remand back a case to the adjudicating authority under section 85 of the Finance Act, 1994? Point of Dispute: The question of law which was raised in this case was that whether the Commissioner (Appeals), exercising powers under section 85 of the Finance Act, 1994, has the power to remand the proceedings back to the adjudicating authority (AA). Department contended that amendment made in section 35A(3) of the Central Excise Act, 1944, in the year 2001*, the powers of remand specifically granted to the Commissioner (Appeals) were taken away. High Court’s Decision: The High Court, therefore, held that section 85(4) of the Finance Act, 1994 gives ample powers to the Commissioner while hearing and disposing of the appeals and such powers inherently contain the power to remand a proceeding for proper reasons to the adjudicating authority. The Delhi High Court in the case of Commissioner v. World Vision 2011 (24) STR 650 (Del.) has also held that under section 85(4) of Finance Act, 1994, the Commissioner (Appeals) has the power to remand back the case to the adjudicating authority for fresh consideration. 23 Whether the period of limitation or the period within which delay in filing an appeal can be condoned, specified in terms of months in a statute, means a calendar month or number of days? 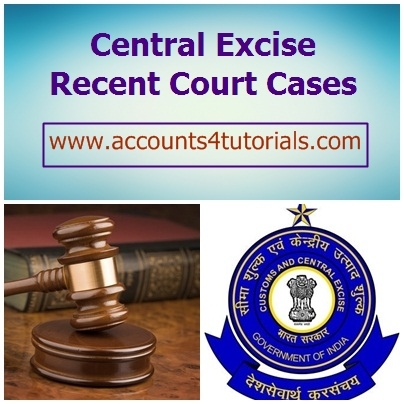 Assessee received the adjudication order on 08.10.2011 and filed an appeal against the said order before Commissioner of Central Excise (Appeals) n 09.04.2012 along with an application for condonation of delay. Dismissed by Commissioner for being time barred. On Appeal to Tribunal, it decided to condone delay, 3 months prescribed under section 85(3) of the Finance Act, 1994 meant 3 calendar months and not 90 days and Proviso to said sub section empowered Commissioner to condone the delay for sufficient cause so as to allow the appeal to be presented within a further period of 3 months. Point of dispute The issue which came up for consideration before HC was whether the period of limitation or the period within which delay in filing an appeal can be condoned, specified in terms of months in a statute, means a calendar month or number of days. Once the legislature has used the expression “ 3months” both in the section 85(3) of Finance Act, 1994,as well as in Its proviso*, It would not be open for the HC to substitute the words “3 months” by the words “90 days” and if it does so, it would amount to rewriting the legislative provision, which is impermissible. Further, the day on which order was received by the assessee, i.e. 08.10.2011 had to be excluded while computing the period of limitation in view of section 9 of said Act(General Clauses Act, 1897). Since the original period of limitation and the period within which delay could be condoned expired on a public holiday, i.e. 08.04.2012, the assessee filed the appeal on the next working day, i.e. 09.04.2012. High Court’s Decision: In the given case, the Commissioner of Central Excise (Appeals) had the jurisdiction to condone the delay in filing of appeal by the assessee as the same had been filed within the stipulated time prescribed for the same. Supreme Court, in case of M/s. Econ Antri Ltd v. M/s. Rom Industries Ltd. & Anr, had also taken a similar view on this point and decided that while computing the period of limitation, the day on which the offence is committed/ date of cause of action has to be excluded. 24. Can the appeal filed in time but to wrong authority be rejected by the appellate authority being time barred? Assessee filed an appeal to Commissioner, By mistake gave it to the adjudicating officer who had passed the original order. Point of dispute: Dept contended that although appeal was received in time by the adjudicating officer, appellate authority rejected the appeal as the same was not received in its office in time. 25. Would countervailing duty (CVD) on an imported product be exempted if the excise duty on a like article produced or manufactured in India is exempt? Supreme Court’s Decision: Supreme Court held that rate of additional duty leviable under section 3(1) of the Customs Tariff Act, 1975 would be only that which is payable under the Central Excise Act, 1944 on a like article. The importer would be entitled to payment of concessional/ reduced or nil rate of countervailing duty if any notification is issued providing exemption/ remission of excise duty with respect to a like article if produced/ manufactured in India. 26. Whether the mobile battery charger is classifiable as an accessory of the cell phone or as an integral part of the same? on the mobile battery charger was applied, as applicable on the mobile phone. It also admitted that whenever it sold the chargers separately, tax was not charged at the concessional rate. Dept opined, a battery charger was not a integral part of the cell phone but was an accessory thereof. Concessional rate of tax applicable on cell phones was not applicable to the mobile battery chargers. Supreme Court’s Decision: The Apex Court held that mobile battery charger is an accessory to mobile phone and not an integral part of it. Further, battery charger cannot be held to be a composite part of the cell phone, but is an independent product which can be sold separately without selling the cell phone. 27. Can the value of imported goods be increased if Department fails to provide to the importer, evidence of import of identical goods at higher prices? Department valued such goods on the basis of transaction value of identical goods as per erstwhile rule 5 [now rule 4 of the Customs Valuation (Determination of Value of Imported Goods) Rules, 2007] and demanded the differential duty alongwith penalty and interest from the appellant. However, Department did not provide these printouts to the appellant. Appellant contention: Department? s demand was without any basis in law, any legal evidence and opposed to natural justice as the computer printout which was the evidence was missing and the appellant had no means of knowing as to whether any imports of comparable nature were made at the relevant point of time. Supreme Court’s Decision: The Supreme Court held that mere existence of alleged computer printout was not proof of existence of comparable imports. Even if the printout did exist and content was true such printout must have been supplied to the appellant and it should have been given reasonable opportunity to establish that the import transactions were not comparable. Thus, in the given case, the value of imported goods could not be enhanced on the basis of value of identical goods as Department was not able to provide evidence of import of identical goods at higher prices. 28. Can a writ petition be filed before a High Court which does not have territorial jurisdiction over the matter? Facts of the Case: Assessee filed a writ petition before the Delhi HC against the order in original passed by the Commissioner of Customs of Kanpur. Jurisdictional HC for the petitioner would have been Allahabad HC When the Revenue raised objection over the territorial jurisdiction of the High Court, the assessee withdrew the appeal from the Delhi HC and filed the appeal with the Allahabad HC with the application for condonation of delay. The Allahabad HC dismissed the application f or condonation of delay and It opined that appeal was time barred. Then, the assessee filed a special leave petition with the Supreme Court. Supreme Court’s Decision: The Supreme Court observed that the very filing of writ petition by the petitioner in Delhi HC against the order in original passed by the Commissioner of Customs, Kanpur indicated that the petitioner had taken chance in approaching the Delhi HC which had no territorial jurisdiction in the matter. The filing of the writ petition before Delhi HC was not at all bona fide(genuine). 29. Is limitation period of one year applicable for claiming the refund of amount paid on account of wrong classification of the imported goods? The petitioners imported tunnel boring machines which were otherwise fully exempt from customs duty. However, owing to erroneous classification of such machines, they paid large amount of customs duty. After expiry of more than 3 years, the petitioners filed a writ petition claiming the refund of the amount so paid. The said refund claim was rejected on the ground that thepetitioners failed to make a proper application of refund under section 27 of the Customs Act, 1962 within the stipulated period of 1 year of payment of duty. Note: Section 124(a) of the Customs Act, 1962, inter alia, stipulates that no order confiscating any goods or imposing any penalty on any person shall be made under this Chapter unless the owner of the goods or such person is given a notice in writing informing him of the grounds on which it is proposed to confiscate the goods or to impose a penalty. Further, section 110(2) of the Act stipulates that where no such notice is given within six months of the seizure of the goods, the goods shall be returned to the person from whose possession they were seized. 30. Whether mere dispatch of a notice under section 124(a) would imply that the notice was “given” within the meaning of section 124(a) and section 110(2) of the said Customs Act, 1962? 6 months (extendable upto one year) of seizure of the goods. Otherwise, goods need be returned to such person. However, in the present case, the notice under section 124(a) was dispatched by registered post on the date of expiry of stipulated period under section 110(2) and received by the petitioner after the expiry of such period. Revenue, referring to section 153(a), submitted that the moment a notice is tendered or sent by registered post or by an approved courier, that amounts to service of the noticeand the actual receipt by the noticee is not a relevant consideration. The Delhi HC observed that section 124(a) clearly stipulates that no order confiscating any goods or imposing any penalty on any person shall be made unless the owner of the goods or person from whom goods have been seized is “given a notice” in writing, “informing him of the grounds on which it is proposed to confiscate the goods or to impose a penalty”. The Delhi High Court was in complete agreement with the Supreme Court’s decision in case of K. Narsimhiah as followed by Gujarat High Court in case of Ambalal Morarji Soni. case was arrived at on the (wrong) premise that section 124 requires that a notice be “issued” as against a notice being “given” when the body of the provision of section 124 nowhere uses the expression “issue of show cause notice” The Delhi HC also disagreed with the Calcutta HC’s observation that the word “given” used in Section 110(2) and section 124(a) is in any manner controlled by section 153. High Court’s Decision: The High Court held that since the petitioners did not receive the notice under section 124(a) within the time stipulated in section 110(2) of the Act, such notice will not considered to be “given” by the Department within the stipulated time, i.e. before the terminal date. Consequently, the Department was directed to release the goods seized. YES U CAN WIN. WORK HARD SO HARD, SUCCESS HAS TO EMBRACE YOU. HARD WORK IS NECESSARY, BUT RELAXING IS ALSO EQUALLY ESSENTIAL NOTHING IS IMPOSSIBLE. PLANNING IS IMPORTANT, IMPLEMENTING THE PLAN IS MORE IMPORTANTPOSITIVITY, SINCERE EFFORTS, DISCIPLINE , HARD WORK, SMART WORK WILL POWER DETERMINATION HELPS YOU ACHIEVE YOUR GOALS.